ONE (1) package of NORDIC KNIT TAG clear stamps by Kimberly Wiener in the Limited Run Stamps line. There are 11 pieces of clear stamps in the package. This stamp is in a 4x6 backing sheet packaged in a 4x6 resealable hang hole cello bag. 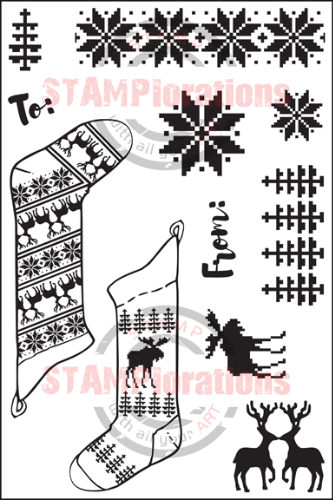 For your reference, the largest stamp (stocking) is approximately 1.5" wide and 3.5" tall; the snowflake border is approximately 3" wide and 0.75" tall.